You've found the “U.S. Berkshire Pig Breeders” page here at Hobby Farm Wisdom! If this is the first time you have visited our site: Welcome! Berkshire pigs are a rare breed of pigs native to the English county of Berkshire. 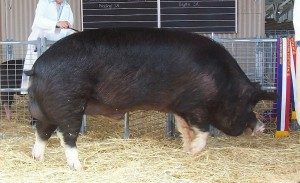 So rare in fact, that as of 2008 there were only 300 known breeding sows in existence. Today, Berkshire pigs are smaller than their ancestors and are solid black with prick ears, white socks and white tip to tail. These pigs are known for their prized pork, which is said to be extremely juicy, flavorful and tender. It is typically a pink-hued, heavily marbled meat that dresses white. There is a high demand overseas for this breed of pig, especially in Japan where it is marketed as Black Pork and sold at a premium price.